Looks like eSIM adoption is on the rise, as Bahrain becomes the fourth country to support it. VIVA is the telecom operator that has currently deployed it in Bahrain. With the release of iOS 12.1, it’ll allow users to enjoy Dual SIM functionality as the iPhone XS and XR are already available for purchase. I’ve also updated the below table on countries that have already deployed it and which mobile carriers support it. As of the moment of publishing, I’ve tabulated the mobile carriers in the Middle East that have rolled out eSIM support on their networks. Qatar, UAE, and Kuwait laid the groundwork weeks before the release of iOS 12.1, which would allow iPhone owners to use the new Dual SIM feature. With the release iOS 12.1 on 29 October, those who have already gotten their eSIM can start using Dual SIM feature. As a reminder, note that the iPhone XS, XS Max, and XR models sold worldwide have a physical nano-SIM + eSIM combination to support Dual SIM. Ooredoo Qatar is offering unlimives local calls and data for three months to new and existing customers. This is applicable for both pre-paid and post-paid users. Vodafone Qatar is giving 1TB of data over three months to each customer that gets an eSIM from them. There’s been no word of any similar incentives from UAE and Kuwait, but that may change given that iPhones are quite popular in the Middle East. As an added bonus, Ooredoo Kuwait made a nice instructional video on Instagram on how to set up your iPhone using an eSIM. Given that Apple had shown three US carriers (and also lists them on their Support page) that will support eSIM at their September 2018 event, it looks like the Middle East region has beaten the largest mobile market to the eSIM rollout finish line. P.S: Apple has made a nice Support guide on using Dual SIM with an eSIM. Looks like the Ooredoo Group is getting ready to roll out eSIMs very soon in Qatar and and Kuwait. du in the UAE has already announced. Hence, the release of iOS 12.1 is approaching fast and that means Dual SIM use on the new iPhones will be enabled. The Ooredoo Group has a presence across a good number of countries from North Africa to the East. Since they’re based in Qatar, it looks like Ooredoo Qatar is almost ready to roll out support for eSIM on their network once Apple enables it with their 11.1 iOS update. 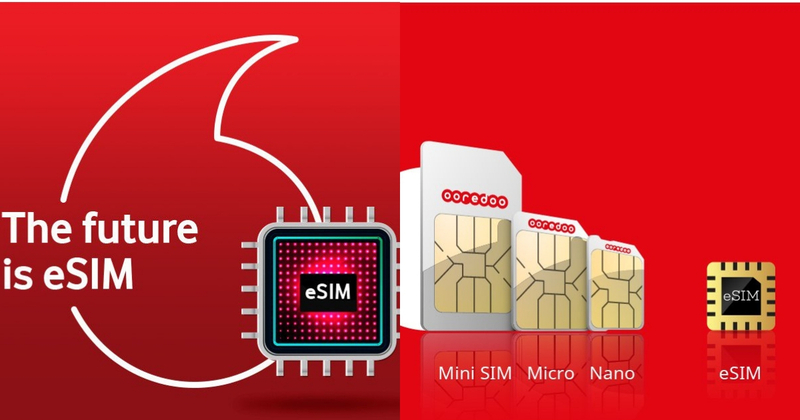 With a little help of Google Translate and scouring the net for more countries in the Middle East that may support eSIM, the Kuwait-based chapter has already tested out eSIM support on Ooredoo Kuwait. The news was announced on Ooredoo Kuwait’s official Twitter account (below) and found one mention regarding this announcement on the Kuwait Times. Ooredoo also has a presence in Oman, so it’s only a matter of time before they extend eSIM support there as well to cover their Middle East markets. All of this hinges on when Apple releases 12.1 for eSIM support, but it’ll definitely be before the end of 2018. It may sound too good to be true but may not. Vodafone Qatar is already allowing its customers to use the new eSIM standard with the iPhone XS. For once, Vodafone Qatar has the upper hand against Ooredoo Qatar. Don’t believe me? They’ve already published a video explaining that it happens when you visit their store in Villagio Mall. Vodafone Qatar has limited availability of the eSIM at their Villaggio branch, given that the new iPhone XS and XS Max are now officially available in Qatar and other markets as part of the second launch wave. If it’s any consolation to you, you were likely finding ways to buy the Made For China version of the new iPhone XS – it allows you to put two physical nano-SIM cards inside to use Dual SIMs on the same device. The rest of the world would get Dual SIM support in the form of a physical SIM and eSIM. You may think it’s going the more proprietary route, but Apple has been known to push newer standards that became widely adopted. As Apple looked ahead and incorporated some form of a new SIM card type in the LTE models of the iPads, it didn’t spark the adoption rate by mobile carriers to adopt it. The iPhone XS and XS Max served as the perfect catalyst for it. The wake-up call nobody expected, and now more carriers are likely rushing to adopt it. Although the UAE’s Etisalat launched eSIM support to allow the Apple Watch Series 3 Cellular model to work in the country, it was the only mobile carrier in the entire MENA region to support this. Now it looks like Qatar has risen up – both Vodafone Qatar and Ooredoo Qatar have announced that they are rolling out support for the eSIM standard. Both have been touting the roll-out of 5G, and it would have been an embarrassment that they didn’t embrace something novel as the eSIM to showcase the forward-thinking infrastructure for their cellular and fixed-line network. Great news! We have successfully tested the first live eSIMs on our Supernet! The current tally for the Middle East and North Africa countries supporting eSIM now tallies to 2 – Qatar and UAE. Ooredoo has a presence in Oman and Kuwait, so we could see those countries rolling out support soon. Beyond iOS, other Android-powered smartphone makers would definitely scramble to support the new eSIM standard. In addition, we could even see more eSIM-powered devices being widely available; it won’t just be the Apple Watch Cellular models, we’re talking about other devices that won’t be tethered to a smartphone and can independently communicate with each other. With iPhone owners who are in top corporate jobs in Nairobi, I see many of them having two iPhones and the reason is the battery life of an iPhone won’t last through an active, busy, day and so they will use one phone till the battery runs flat then switch to the other. So having two batteries trumps having two SIM’s in a phone. And others manufacturers of smartphone here – Oppo, Huawei, Nokia etc. emphasise the battery life (2+ days) of their phones as a key selling point over Apple.